Awesome variety in California terrain! Alpine lakes to jagged granite peaks; Streamside fishing to lush wineries; Coastal bluffs and surfing to dense redwoods forest. Find your perfect camp - RV resort, small campgrounds or free camping (on the back roads). Oak shaded country hills. Pine forested mountains. City close suburban camps. Joshua trees in the open desert. Seaside beach camping. 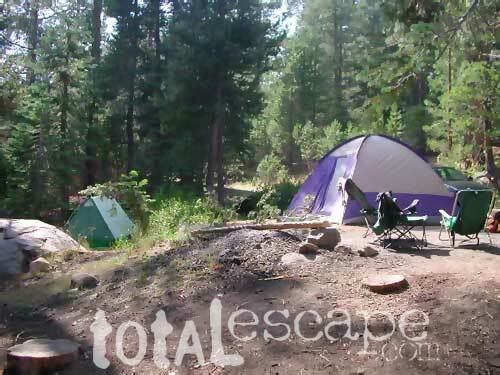 Camping is available all year long within California. Popular destination camps fill up fast on any given Friday (in the summer time or any warm weekends), anytime of the year. Holiday wweekends are busiest. Most of the well-known 'scenic spots' in California recommend a campground reservation. Camping rates and availability vary with location and season, but expect to pay a premium at most all State Parks, National Parks and most all lake camping. Small Campgrounds are located on the highways often charge less fees; The smallest of campgrounds (on back roads) have fewer ammenities, meaning really cheap, or free of charge. Bring your own toilet paper. Get yourself a shovel, a bucket and obtain a free campfire permit, so you can camp is designated areas for free. California BLM and most National Forests have open camping, dispersed camps, otherwise known as free primitive camp sites, located far away from everyone! Primitive camp sites on back roads usually have no bathroom facilities available, so bring your shovel and toilet paper.